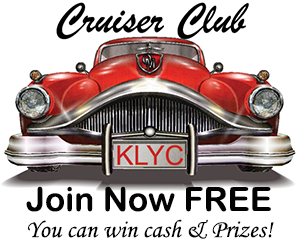 Great Easter Bunny Hop Away from KLYC The Cruise! Get your chance to win one of four Giant stuffed Easter Bunnies. Registration is absolutely free and all you have to do is visit one of 4 stores in MAC to sign-up and win. You can sign up at all four locations, but you can only win ONE of the Easter Bunnies. WAIT…. signing up at all 4 locations increases your chances of winning. 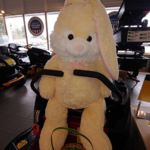 No purchase necessary to register or win, just come in and tell someone working at the location you want a chance at winning the Great Easter Bunny Hop Away. Edge Exchange, 1117 NE Adams St.
Sears Hometown Store, 1621 NE Baker St.
Limit of one entry per household at each location. You are encouraged to sign up at all four locations. The entries at each location will be used in the drawing for the bunny at that location. You can only win one bunny, even if your name is drawn at more than one location. If you have already won a bunny, and your name is drawn at another location. KLYC will draw another name. Drawing will be 5pm Good Friday. There will be a separate drawing at each location and you don’t have to be present to win. Employees and contractors of KLYC are not eligible to register or win. No purchase necessary to register or win.